A powerful and sophisticated underground business delivers thousands of refugees a day all along the Mediterranean coasts of Europe. Overall, the trafficking industry today is bigger than the illegal drug trade and worth hundreds of billions of dollars annually. The new breed of criminals that controls it has risen out of the political chaos of post-9/11 Western foreign policy and the fiasco of the Arab Spring and, more recently, the destabilization of Syria and Iraq coupled with the rise of ISIS. New opportunities for crime have opened up in the Middle East, from selling Western hostages to jihadist groups, to trafficking millions of refugees. 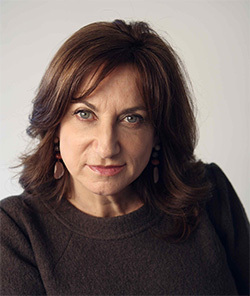 Loretta Napoleoni is a journalist, author and economist who has written and lectured widely on the financing of terrorism. 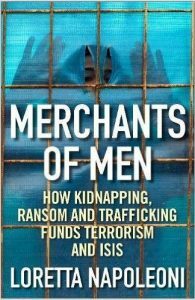 As chairman of the counter terrorism financing group for the Club de Madrid, she brought heads of state from around the world together to create a new strategy for combatting the financing of terror networks, and her latest book Merchants of Men: How Jihadists and ISIS Turned Kidnapping and Refugee Trafficking into a Multi-Billion Dollar Business was published in the UK in January 2017 by Atlantic Books. The end of the Cold War was thought to signal the triumph of Western capitalism over Communism, but in her new book Maonomics: Why Chinese Communists Make Better Capitalists than We Do, Loretta Napoleoni argues just the opposite. Instead she suggests that we are misconstruing China and its economy even as we acknowledge its growing influence and importance, and are actually witnessing the beginning of the collapse of capitalism and the victory of “communism with a profit motive”: Commi-capitalism. Loretta is an economist and an expert on terrorist financing and money laundering, and advises several governments and international organizations on these issues. She writes and broadcasts widely, and her books have been translated into 18 languages including Chinese and Arabic. The Italian edition of Maonomics won the prestigious Premio dell’Associazione per il Progresso Economico. Loretta Napoleoni is an economist and expert on the economics of terrorism. She has several books to her credit, including a remarkable study of Arabic finance, its connection to Islamic terrorism and interface with western economies (see Cafe Diplo 24th January 2004). Her book “Terror Inc.” was published by Penguin, and “Made in America: Al Zarqawi & the Future of the Islamic Jihad” will be published in November by Constable & Robinson. This talk will cover the US creation of the myth of Al Zarqawi, his impact on the insurgency in Iraq and on the Jihadist movement in the West. Loretta was once consultant for US Homeland Security and was the Chair of the Countering Terrorism Financing Group for the Madrid Conference on Democracy, Terrorism and Security. Dr. Napoleoni traces the ‘economy of terror’ world-wide, and maps out a 1.5 trillion dollar economic system feeding illegal organisations from Al Quaeda to the Contras. This circuit comprises illegal businesses such as arms and narcotics, oil and diamond smuggling, and includes charitable donations in an intricate system of finance, revealing the inter-dependency between economics run by armed groups and western economies. Dr. Napoleoni is the first author to tackle the issues raised by September 11th from a specifically economic perspective. Shifting the focus away from religion and culture, Napoleoni assesses the role of the West in the development of armed organisations. She is an economist and an expert on terrorism. Her book “Modern Jihad, the New Economy of Terror” is published by Pluto Press.